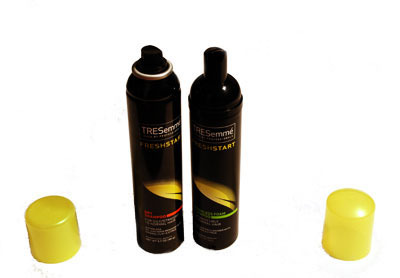 TRESemmé FreshStart Dry Shampoo for oily/straight to normal hair and TRESemmé FreshStart Waterless Foam Shampoo for dry/curly hair are used to clean hair without water anytime. It claims to remove oil, odor, and maintain hair health by allowing you to shampoo your hair less frequently. Dry shampoos were created a few years ago as an alternative to shampooing your hair with water. Benefits of shampooing your hair without water include saving time, convenience and accessibility, and preserving the health of your hair by shampooing less often and not needing to use heat to style your hair. While there are many brands of dry shampoo on the market, it has almost exclusively been a high end consumer product — sold mostly at salon’s, department stores, and luxury beauty stores, with the high end price. TRESemmé, being ahead of the curve, launched two waterless shampoo formulas this month that are available in drugstores, and are a mere fraction of the price tag most other dry shampoos have. TRESemmé FreshStart Dry Shampoo for oily/straight to normal hair comes in a can that looks almost identical to a hairspray. The product sprays out exactly like hairspray, as well, and is intended to be used about 8-12 inches from the roots of your hair, leaving behind a fresh, citrus scent. You will instantly notice that the formula soaks up any oil from your scalp, and leaves your roots feeling very clean and voluminous, similar to having a fresh blowout. Many dry shampoos I have tried in spray form have a scent that is too strong, lingers on my hair, and smells funky. The product scent delivers as promised with a light citrus scent that smells clean and feminine, not overpowering or chemical like. This spray formula definitely works best on those with fine, oily, and/or straight hair, as it deeply penetrates the hair shaft and scalp to soak up dirt and oil. Your hair is left completely dry, with a soft, clean texture to it that is ready to style as normal. 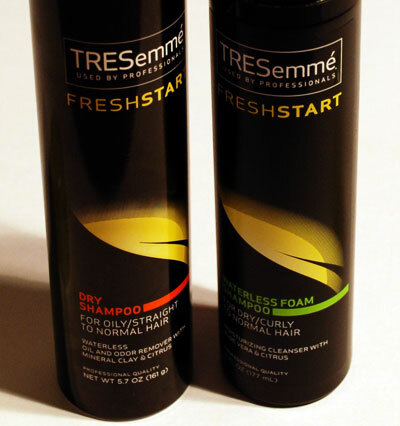 TRESemmé FreshStart Waterless Foam Shampoo for dry/curly hair is essentially the same product as the spray dry shampoo, but in mousse form, intended to work specifically on hair that needs moisture and refreshment. The waterless foam shampoo pumps out into your hand as a light foam that can then be rubbed into your roots. The scent on the waterless foam shampoo is exactly the same as the dry shampoo, but contains aloe vera, to add moisture to curly or brittle hair. I bought this formula to test it against the dry shampoo even though I do not have dry or curly hair, and though it worked as intended, it left my roots feeling slightly damp, and felt a bit heavy for my hair, which I did not like. I then used this product on my niece, who has a head of tightly wound curls, and the moisture was perfect for her hair type, leaving behind no dampness. Both of these products have multiple uses that are convenient for many different lifestyles. These products are perfect for many types: a person-on-the-go to store in their bag for quick touch ups, a gym goer who wants to soak up sweat and refresh their hair without a shower, someone who color treats their hair and wishes to preserve their color as long as possible, someone who is short on time, or even someone who wishes to remove a specific scent (i.e, cigarette smoke) from their tresses. The dry shampoo and waterless foam allow you to start with a clean slate, removing any residue or product from your hair, giving you a blank canvas with which to style your hair. Bottom line: TRESemmé FreshStart Dry Shampoo and TRESemmé FreshStart Waterless Foam Shampoo are efficient, inexpensive, accessible alternatives to more expensive formulas on the market. The product scent is very desirable when compared with other dry shampoos on the market, and remove odor, oil, and residue from your hair. However, be sure to view the product labels, and buy the correct TRESemmé FreshStart formula for your hair type, or else you may have undesired results. What is your hair type, Lachelle? I was unsure which would work better for me in the drugstore…luckily, it wasn’t like splurging on a $30 dry shampoo and then disliking it! First off, shampooing your hair every day is bad (I’m sure you knew that). 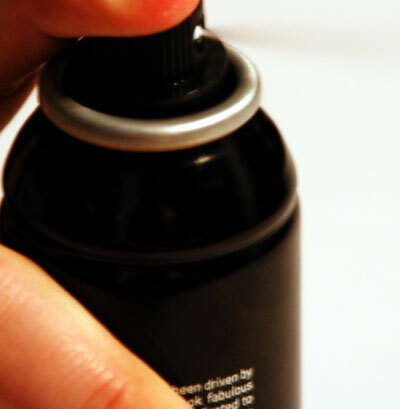 Dry shampoo is therefor a great alternative! If I can find this at my local drug store, I will pick up the one of each! This product just might save my life, and my hair. I wash my hair every morning. Which I know is bad, but if I didn’t my hair would be oily and gross by midafternoon. Thank you for your review on this product. I am looking forward to giving it a try! I think I will definitely try this option. I have used higher end dry shampoos and while they are great they are also really pricey. thanks for reviewing this!! i just bought this product today at cvs. its a great price and i bought two other products: 3 items from the same line for $10!! That is such a fabulous find, Cynthia! Glad to see CVS is putting these new products on sale so everyone can try them out. i have extensions at the moment and even tho it is remy hair (a nice form of human hair) washing too much cant cut the life of the hair short. so i picked up the waterless foam( my hair is a lil dry and wavy n so is the installed hair) and it really helps keep the hair fresh w out over washing it. so i do reccomend this to ladies with weaves extensions ect. Welcome to the site, teetee! Thank you so much for your fabulous, informative review for ladies with weaves and extensions! I am very glad this product worked well for you. So I finally picked up the foam version of this and I like it so far. This is my first day using it because I felt like my hair really didn’t smell the freshest and I wasn’t going to be able to wash my hair until this weekend. So far loving it! Thanks for reviewing. Welcome Vicki! I am so glad you love this dry shampoo. It really is my favorite dry shampoo, as well, and I continue to go through bottles of it! Anyone know if this works on African American hair? I have a niece with that type of hair and we hate getting it wet knowing washing it can dry it out. Would this be an alternative? I am african american and I work out 5 days a week and sweat a lot and would love to know if this product works for me in between washings? Hi Robin…welcome to the site. I would definitely recommend the waterless foam shampoo for you…especially if your hair has a lot of texture to it. I typically tell anyone without fine hair to for the waterless foam, and anyone with very fine, limp hair to go for the dry shampoo spray. The waterless foam is perfect to rub into your scalp after a workout, then simply brush and style as you normally would. It will help soak up that excess oil and sweat, and also get rid of any odor from working out! well after i take bath the very next day my hair becomes oily hope this product of dry shampoo works on my hair ! !